This fourth edition of Sir John Hale’s classic history of England and the Italian Renaissance includes a detailed introduction by Edward Chaney surveying scholarly developments since the book was first published. 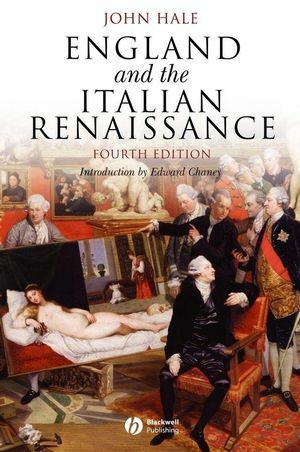 Fourth edition of Sir John Hale’s classic history of England and the Italian Renaissance, first published in 1954. The book’s focus on fundamental issues and basis in little-read primary sources ensures that it endures as an important contribution to historical scholarship. Clear, chronological narrative, beautifully written. Provides essential understanding of the period, illuminating both British and Italian cultural history. The fourth edition includes a new introduction by Edward Chaney who is an expert on Anglo-Italian cultural relations. Chaney surveys the scholarship of the last 50 years and supplies an up-to-date bibliography. John Hale was formerly Professor of Italian History at University College London. He had been a Fellow and Tutor in Modern History at Jesus College, Oxford; the founding Professor of History at the University of Warwick; a visiting fellow at the Harvard Centre for Renaissance Studies, I Tatti, Florence; and Professor of Italian at University College London. He was a fellow of the British Academy, a former chairman of the Trustees of the National Gallery and was knighted for ‘services to learning and the arts’ in 1984. His books include England and the Italian Renaissance (1954), Machiavelli and Renaissance Italy (1961), Renaissance Exploration (1968), Renaissance War Studies (1983), War and Society in Renaissance Europe 1450-1620 (1985) and The Civilization of Europe in the Renaissance (1993). Professor Hale died in 1999. Edward Chaney is Professor of Fine and Decorative Arts and founding Chair of the History of Collecting Research Centre at the Southampton Solent University. He is the author or editor of several book on Anglo-Italian relations, including The Evolution of the Grand Tour: Anglo-Italian Cultural Relations since the Renaissance (1998) and The Evolution of English Collecting: Receptions of Italian Art in the Tudor and Stuart Periods (2003). Introduction to the Third Edition: Edward Chaney. 1. The Beginnings of Interest: mid-Sixteenth to mid-Seventeenth Centuries. 2. From Description to Speculation: mid-Seventeenth to Late Eighteenth centuries. 3. Taste for Italian Paintings: I Sixteenth to Late Eighteenth Centuries. 4. The Medici and William Roscoe: Late Eighteenth to Early Nineteenth Centuries. 5. Taste for Italian Paintings: II Late Eighteenth to Early Nineteenth Centuries. 6. Prejudice and the Term Renaissance: Early to mid-Nineteenth Century. 7. Taste for Italian Paintings: III Early Nineteenth Century to Ruskin. Clear, chronological narrative, beautifully written.